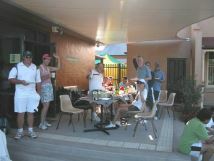 Last weekend the local tennis club of which I am a member had an open day. We marketed the day pretty heavily to the local community over the course of a couple of weeks, and got a great turnout. In order to ensure we could follow up, we collected the email addresses of visitors by offering entry to a raffle for a new racquet. I have just completed transcribing the emails into our system, and considering how we may have done it better. A number of factors were absolutely obvious, and whilst they should not have been a surprise, the extent of the change evident in our collective behaviour was indeed a surprise. We asked for phone numbers, but did not specify mobile or landline. Every single number we got, which was every visitor except one, gave us a mobile number, not one landline. With one exception, every person, irrespective of age, gave us an email address. A quick look at the analytics on the website over the past few weeks shows that just over 76% of the hits have come from mobile devices. Whilst the numbers involved are not huge, the dominance of mobile surprised me. I read, and talk about the switch to mobile every day, but it has been to date a theoretical fact, something I was aware of, understood, but had not brushed against directly to the extend that the general numbers indicated. Now however, the understanding of the numbers has a very personal dimension, and I have absorbed the lesson rather than just understood it. Unusually for me I have been at home for the last few weeks, and I have been answering the home phone while my wife is away. In the two weeks, there have been quite a number of calls, every single one a telemarketer. Why am I paying line rental? It seems it is to give telemarketers access. I think I will cancel the landline, the boss will never notice when she gets home, unless she really likes the sales calls. This entry was posted in Change, Marketing, Small business, Social Media and tagged Change, communication, Marketing, marketing analytics, performance assessment, SME. Bookmark the permalink.